This leadership workbook, in its 4th Edition, may well be one of the most valuable collection of pragmatic coaching tools you will find for developing your staff. Packed with numerous coaching tools, you will find immediate application in bringing out the best of your top performers and working through performance issues with your more challenging employees. 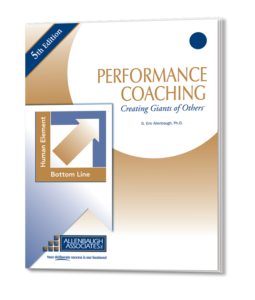 For best results, get a copy for each employee to compete their own performance enhancement plan. $17.50 each plus S&H – quantity discounts available. Order your copies through Allenbaugh Associates today.